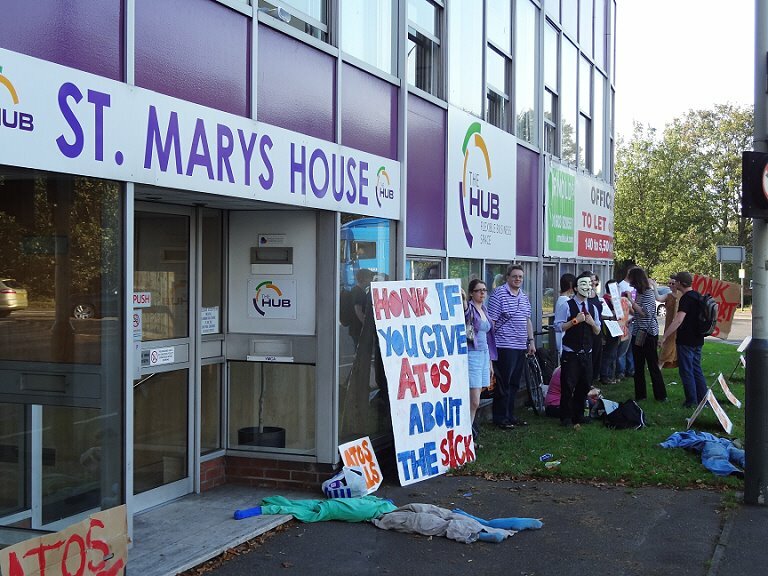 17 towns and cities around the UK saw actions and protests outside Atos offices as part of the National Day of Action Against Poverty Pimps Atos ‘Healthcare’. Atos are responsible for carrying out the notorious Work Capability Assessment, a ruthless health testing procedure which has led to thousands of sick and disabled people being denied or stripped of vital benefits. In London a protest was held outside the BMJ Careers Fair at the Business Design Centre in Islington where Atos were exhibiting in the hope of recruiting more doctors to join their disability assessment teams. Around 50 people gathered from noon with banners and began distributing hundreds of leaflets to doctors reminding them of the fundamental medical principle of ‘First Do No Harm’. The response from doctors was largely positive with many reassuring people that they had no intention of seeking employment with such a disreputable organisation. 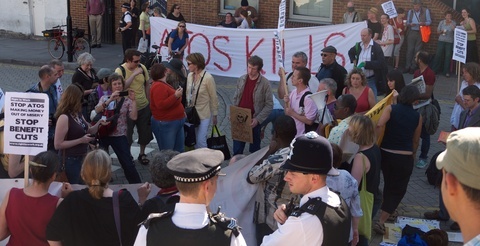 Whilst the BMJ had laid on tables and chairs for demonstrators some way away from the entrance to the venue, they were barely accessible to wheechair users and situated in glaring sunshine. 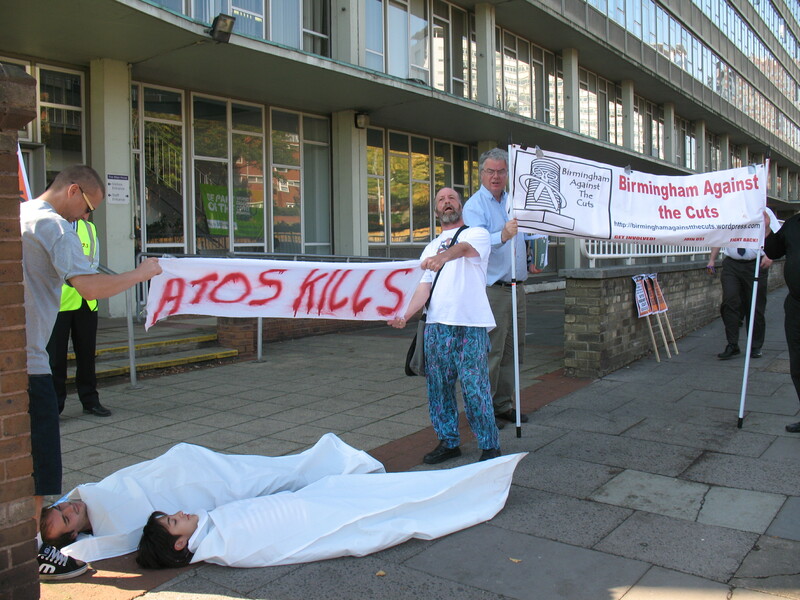 Despite the efforts of police protesters refused to move and the protest remained at the foot of the drive way leading up to the venue where a large banner was unfurled reading ‘Atos Kills’. Many people spoke of their experiences at the hands of Atos whilst there were speeches from the Islington and national Disabled People Against Cuts groups, Winvisible, PCS representatives, Mad Pride, student groups, Queer Resistance, Right To Work and many more. The protest lasted the length of the Careers Fair with people taking shifts to cover the entire six hours. Around 100 protesters gathered throughout the day. Several attempts to gain entrance to the careers fair were attempted both by individuals and small groups, however they were manhandled off the premises by police and security guards. Another protest is planned outside the Business Design Centre on 19th October when they will play host to the annual Welfare to Work Conference. 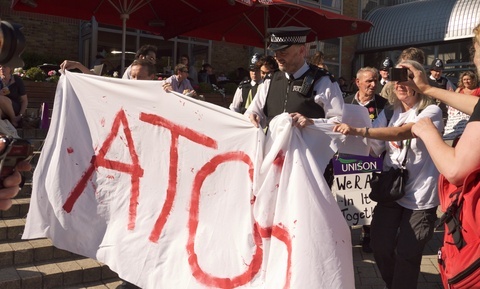 In Nottingham two people were arrested for aggravated trespass after protesters occupied the lobby of the local Atos testing centre. One man, a wheelchair user, was bailed in the street after police were unable to provide accessible transport to the nick. Another was taken down the station, charged and bailed meeting a supportive Critical Mass bike ride on his release. 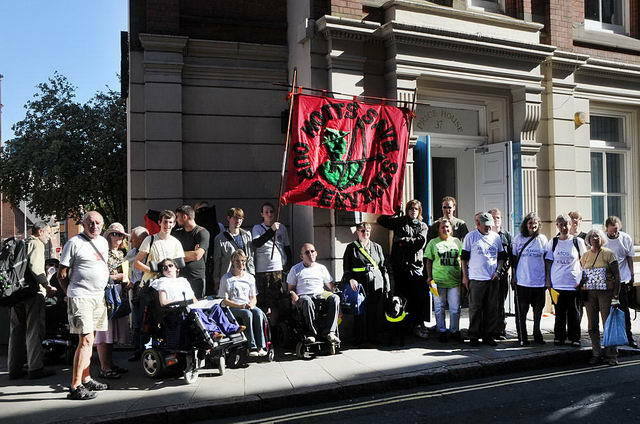 Despite being organised with only two days notice around 15 people gathered in Oxford outside Atos offices. Protesters have vowed to be back. A hastily organised demonstration in Norwich (pictured) drew similar numbers with much support from passing motorists. 300 leaflets were distributed at a protest in Hastings where the Hastings Against Cuts banner was on display. A great response was received from the from the public with overwhelming support from people for the fight against all and any cuts and a huge awareness of the dirty work that Atos are doing at the governments behest. 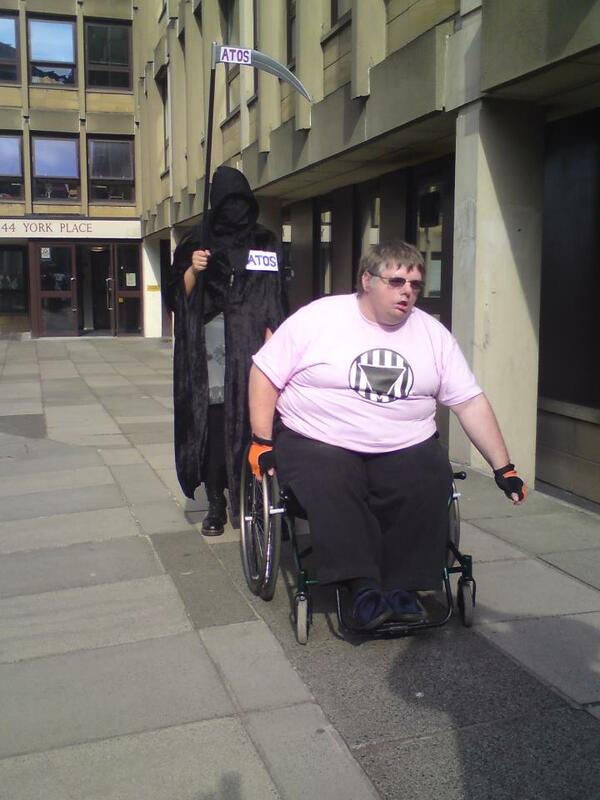 In Edinburgh death made an appearance at the city’s Atos Assessment Centre at a protest called by Black Triangle Campaign whilst the Crutch Collective and others protested outside Atos in Glasgow where Atos were accused of Robbing the Poor to Pay for the Rich, pics can be found at indymedia. A successful Sack ATOS PROTEST in Sheffield was organised by Disabled People United Sheffield, supported by UKuncut Sheffield, the Green Party S.W.P. Legal Aid campaign, S.A.C.A. (Sheffield Anti cuts alliance) and others. 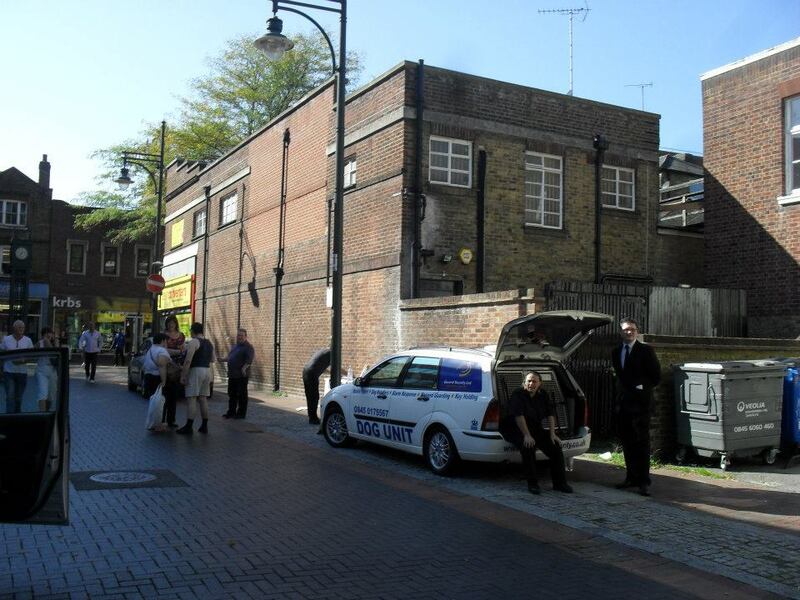 In Chatham Atos showed their usual warm caring side by hiring private security and dog handlers to protect their premises from disabled people and supporters! The protest was called by Medway Against Cuts. Protests were also held in Manchester, York, Leeds, Chester, Plymouth, Bristol and online. Please put links to any reports or pics of these events or any others in the comments. Discussions are already taking place about the next National Day of Action Against Benefit cuts and further actions against Atos – watch this space for details. Wow. That looks like a pretty big turn out. I hope these result in positive changes and more justice and prosperity. so well done to all concerned lets hope this has raised awareness big time and keeps the momentum rolling with more and more people.